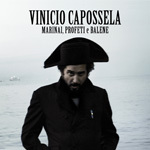 The title of Vinicio Capossela’s two-disk album translates as “sailors, prophets, and whales,” and if that makes you think of literature or the movies, there’s good reason. The lyrics to the 19 songs were inspired by Melville, Conrad, Celine, Dante and Homer, and the Old Testament. The soundscapes created by Capossela, his co-producer Taketo Gohara, and the multinational cast of musicians and singers, have the intimacy of a cinematic close-up and the grand scope of an epic. The film analogy also applies to the record’s production: making this ambitious work entailed a large cast and crew, multiple locations (it was recorded in several Italian cities and on the island of Ischia, and in Berlin, Barcelona, and Brooklyn, USA) and an auteur with the vision and artistic control to make it all cohere in a satisfying whole. Did I say “satisfying?” That doesn’t begin to describe the record. It is, in short, a masterpiece, and Capossela’s best work to date. Born in Germany in 1965 to parents from the southern Italian region of Campania and based in Milan since 1987, Capossela is Italy’s most original and audacious singer-songwriter. He’s often described as “eccentric” but “brilliant maverick” is more apt. I’d go so far as “genius” – an honorific too promiscuously handed out these days, but not in this case. Capossela can write three-minute, hook-y pop tunes in a variety of genres, and also more unconventional pieces that don’t fit any genre, although they may contain elements of familiar ones. Jazz, blues, rock, Italian pop, southern Italian traditional music, vaudeville, Afro-Cuban idioms and Cape Verdean morna all figure in his work, but ultimately Capossela is his own genre. Marinai, Profeti e Balene, released in Italy in 2011, has been re-configured for the international market: the songs appear in a different order than on the original. (There’s also a booklet with English translations of the lyrics and detailed production credits.) A representative of Ponderosa, the worldwide distributor, told me the order of the songs had been re-arranged to group the “American” material on one disk and the more “Mediterranean” and “Homeric” selections on the other. Nice idea conceptually, but not exactly accurate. There are “Mediterranean” numbers on the 13-track, supposedly “American” disk, and Melville-inspired ones, like “The Whiteness of the Whale,” on the six-track “Mediterranean” disk. A more plausible explanation is that a decision was made to group together the more accessible, tuneful stuff on Disk One and the stranger, more challenging material on the shorter Disk Two. Or that’s what a second Ponderosa rep told me. The cover photo has a somewhat crazed-looking Capossela wearing a naval officer’s cocked hat and uniform, a calm, pale sea behind him. It’s the image of a seafarer about to embark on a voyage to unknown places, where he, alone and in the company of other naviganti, will encounter strange experiences, exotic creatures (human and otherwise) and himself, and his destiny. Commander Capossela tells his wondrous tales in an understated, intimate voice that rarely rises above the conversational. He plays guitar, piano, harpsichord and kalimba; the crew handles guitars and keyboards, bass and percussion, horns, and an array of uncommon instruments -- marimbula, boulgari, bendir, Cretan lyra, gamelan, and something called a Boobam. Tom Waits has been a major influence on Capossela, and he has worked with two of Waits’ best-known collaborators, guitarist Marc Ribot and bassist Greg Cohen. Capossela recruited them for Marinai, Profeti e Balene, but Ribot’s only on one track, the terrific opener, “Billy Budd,” along with Cohen; the bassist appears on several other selections. You might wish for more, especially from Ribot, but you don’t really miss them, given the stellar bunch of players Capossela has assembled. And then there are the amazing choruses -- the Coro degli Apocrifi, the Drunk Sailors Choir, Valeria Pilia and the Sardinian Women of Actores Alidos, and the Sorelle Marinetti. Yet despite the numerous musicians and singers and the eclectic instrumentation, the record never sounds overstuffed. Capossela’s vessel, though fully loaded, moves with ease and grace. The tracks encompass sea chanteys (“L’Oceano Oilala,” with its pennywhistle and hearty chorus of mates), hymn-like ballads (“The Grand Leviathan”), and Latin pop (“Octopus of Love,” with music by Joey Burns and John Covertino of Calexico and lyrics by Capossela). “The Madonna of the Shells,” inspired by southern Italian religious folklore, is both avant-garde (in its offbeat instrumentation) and traditional (with the appearance of the kind of brass band you’d expect to hear in the town square of a Mezzogiorno village). The effervescent “Prynti,” featuring those Marinetti sisters, recalls the 1950s Italian pop you might hear in a Fellini film. On “The Whiteness of the Whale” Capossela recites the apocalyptic lyrics in a hushed voice while the orchestra, playing the part of the ocean, swells, crests and recedes. “Aedo” and the Homeric-inspired “Calipso” boast some of the album’s most appealing melodies. © 2012 RootsWorld. No reproduction of any part of this page or its associated files is permitted without express written permission.